Even though we have struggles, even though we have doubts, even though life is hard, even though I mess up daily…YET I WILL REJOICE IN THE LORD. Maybe it’s sickness, maybe it’s divorce, maybe it’s disability, maybe it’s anxiety, maybe it’s a prodigal child. Can you rejoice in GOD even though?? HE is the Sovereign Lord and HE is our strength. All of these “even thoughs” are what God is using to grow our hinds feet. Those hinds feet will allow us to walk upon the heights, cling to the narrow path, grow stronger…and then go back into the valley strong and able to share His love. 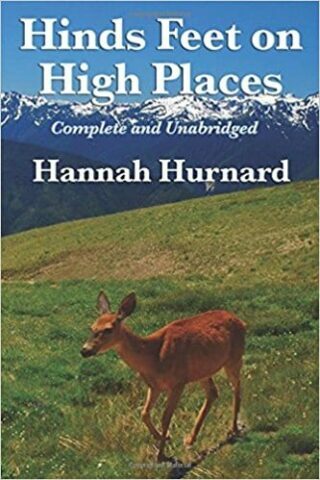 In the book, Hinds Feet for High Places, the main character’s name is Much Afraid. I am fairly certain we can all relate to this name and have felt that would be our name at one time or another. Or maybe even daily. Yet, Much Afraid decides to follow the Good Shepherd up on the heights. Despite her crippled feet and crooked mouth that can’t speak well, she begins the climb. Just like the author of the passage in Habakkuk, many trials await Much Afraid. The path gets narrow. Her enemies Pride, Bitterness and Craven Fear meet her around many corners of the path. Yet the moment she calls out to the Good Shepherd He is there with her. He is listening, caring for her, and helping her on her climb. Yet, He won’t carry her all the way. Because she must develop her own hinds feet. We must all develop our hinds feet. The trials of this life are what develops these feet with which we can withstand the storms of life. If you need to be encouraged on the difficult path you are facing, I highly recommend you check out this classic. 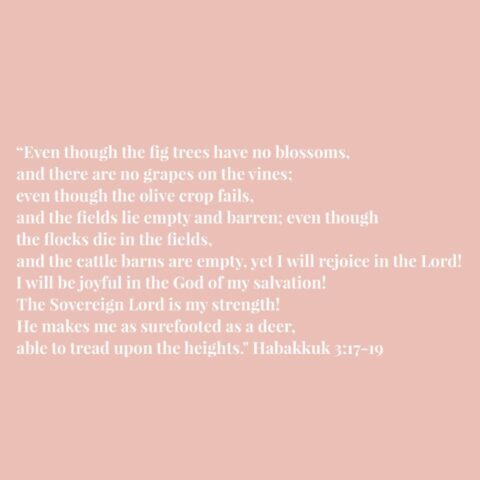 Also spend some time reading and meditating on this passage of Scripture from Habakkuk chapter 3. Ask the Lord to grow your hinds feet and to give you peace, patience and wisdom as you walk the path He has carved out for you. I am reading the children’s book with my kids and it is also excellent!! I know this video and song will encourage your heart just like it has mine!